Recently over at the www.paupermagic.com message boards, esteemed member lathspel has started a thread inquiring as the rules of classic PDC. What he meant, as far as I understand, are the rules of engagement (similar to the Extended argument that took place last week at Star City). The first rule lathspel posits is the ability for a deck to deal more than twenty damage. This speaks volumes about PDC as a format in that it is damage based. There are no Academy Ruins/Mindslaver locks to be had, no infinite life, no viable milling strategy; the way to win is to reduce your opponent to zero. The main way this is done in PDC is through creatures attacking. While control decks will slowly eat away at a life total with critters and some combo decks eschew monsters entirely, PDC is about combat (and ways to make the combat phase work to your advantage). Different decks take different approaches to this: RG Beats seeks to dominate combat with good creatures and burn, making defense difficult; Deep Dog seeks to use tricks such as Aether Burst and large creatures like Werebear to end games quickly once dominance has been established; MUC seeks a slow and painful death through Spire Golem; Parlor Tricks tends to win on the back of Ninja of the Deep Hours and Steamcore Weird long after the opposing board has been cleared; and Orzhov-Blink seeks to create favorable positions through unsolvable creatures and using Momentary Blink to create advantageous combat situations. Another, less utilized way to gain this advantage is through evasion. Lots of evasion- we are not talking about a set of Spire Golems here, but rather a full on aerial assault. This deck excelled at the time because it was faster than most other decks in the field: it made a top 4 with an Affinity Deck and a Pez deck (a deck designed around abusing token generators and Nantuko Husk. The Molten Rains allowed the deck to play disruption against the bounce lands that were rising in popularity, the Fetters stopped everything, and everything save that catch all enchantment and land could be seen as a burn spell. This deck evolved and some of the less stellar cards- such as Sparkmage Apprentice- were replaced with simply better creatures, and can currently be seen in the form of SnowRos. 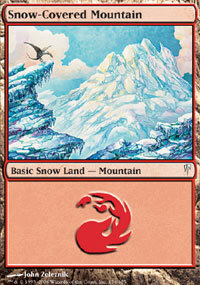 However, that deck lacks the evasive nature of the original Boros Air Force. Herein lies a key in the Skies strategy: creatures are supposed to be burn spells. They are no meant to enter combat, rather they are simply meant to smash face. This was why cards such as the Kami and the Charger were included- to guarantee damage. 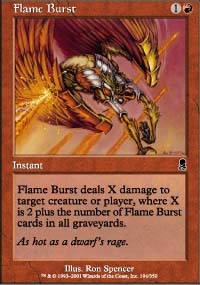 Employing creatures in this deck effectively means treating them as burn spells with free buyback. Looking into my first article for this here site, you can see a deck at the end of the article known as Gray Skies. This deck sought to win via evasive Black and White creatures, combined with Madness, and finishing off with the “burn spell” of Blind Hunter. The disruption there occurred in the form of discard and creature removal, however it lacked the burn back up so vital in a pure burn strategy. Yet for all the good there is in the Skies strategy, Gray Skies uncovered a glaring weakness: the need to win early. 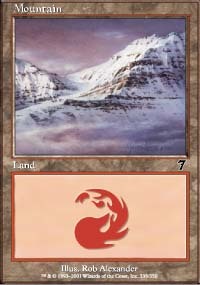 This is why the burn in SnowRos style builds are important- they simply enhance the aggressive nature of a Skies style deck. Other colors lack the ability of Red to burn to the face, regardless of what Planar Chaos has brought. However, that set has opened up a number of options for other potential Skies style builds. 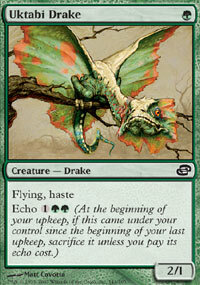 The card that immediately caught my eye for this style of deck after Planar Chaos was Uktabi Drake. Combined with Llanowar Elves, this guy can come down turn two and stick. 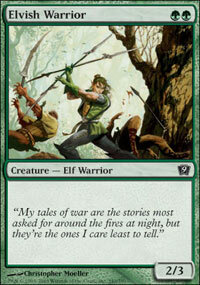 That is an extra two damage over Skyknight Legionnaire, making the Green flyer a nice little burn spell. 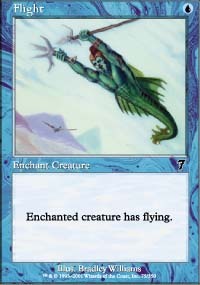 So after those creatures, I started looking for other Green evasive creatures and came across an old favorite of mine, Gaea's Skyfolk. Thus, my colors were set. I was able to fit in more evasion in the form of Looter il-Kor and Giant Dustwasp and general good men in the form of Wild Mongrel and Ninja of the Deep Hours. For disruption, I went with Echoing Truth, four counter spells that are in a constant state of flux, and Piracy Charm. The deck that came out is a blast to play and has potential. Other cards I am still waiting to try out include Skarrgan Pit-Skulk and Coiling Oracle, however those might be better suited for Standard PDC. The deck is prone to spotty draws, and yet is also open to absolutely insane openings. I went with the Wasps because of the ability to hard cast them and 3/3 fliers are good things to have against those pesky Blind Hunters. This deck has been operating at about a 50 percent clip, which tells me it has the potential to do well, but certain tweaks must be made. It lacks the burn and top deck factor the is prevalent in SnowRos and Gray Skies- the best top deck in this case is a Green Shock. And frankly, I really do not feel like trotting out another Deep Dog to the testing floor. Looking back to what I had said earlier about winning the combat war, there are other ways besides simply beating down. Evasion, while nice, can often fail to certain factors, such as a poor draw or a removal heavy deck, or even the impact card out of Planar Chaos (as of now), Aven Riftwatcher, which has been showing up in all sorts of decks. How does one win the combat phase without swinging away? The answer lies in attrition. 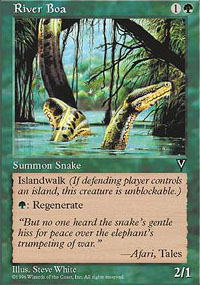 There are certain decks out there that no matter how many times you kill a creature, it will keep coming back. It is this principle that makes cards such as Stinkweed Imp, Gravedigger, and Grim Harvest standard fare in many Black decks. 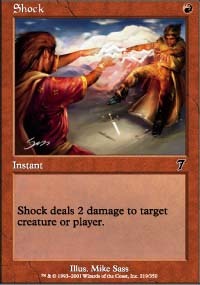 These cards allow the wielder to win the attrition war through smart blocks and recursive creatures. However, even the premier example of the strategy is slow and unwieldy, a 2/2 that costs four. Attrition in PDC is a fine line to walk. The decks that utilize this principle are not easy to play as they require careful resource management. These decks tend to sacrifice early game potency for late game dominance. Since the standard attrition creature costs four, this has meant very scary early games for many attrition decks. However, Time Spiral has given us a conditional Gravedigger for half the cost that plays very well into the attrition line of thought, Pit Keeper. 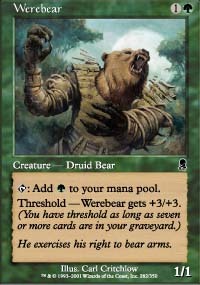 This creature is a great bear, and functions much better when creatures are in the yard, helping you win the late game resource war. This creature gives tan attrition deck much needed versatility, as it can either beat down or chump block early, setting up for the late game lock once there are at least four critters in the bin. In the past, attrition decks have traditionally been Blue and Black, abusing the nature of “comes-into-play” effects and Cavern Harpy. While my first PDC deck was in this vein, I now realize using this strategy annihilates your own tempo, which in my opinion is always a Bad Thing. The goal was the same though: amass resources for late game control, but the game rarely got to that stage. The UB decks of old simply rolled to early aggression. 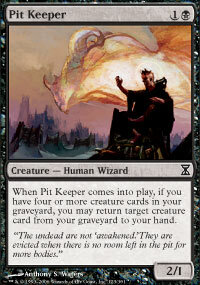 However, I feel that Pit Keeper is the answer to unlocking this deck. This deck is a late game deck- post Turn Five for sure. In the early game, you seek to set up card advantage and favorable blocks, keeping your life in the double digits. The jellyfish help keep you alive and provide useful blockers until you can get a Keeper or Harvest engine going. The removal suite is purely a meta game call. Right now, most creatures have low toughness and many times, -X/-X can be more useful than outright removing a creature. Lose Hope is another personal choice, as I like to smooth out my draws. Richard, another proponent of the deck, runs Funeral Charm in that slot for additional versatility. After threats are contained, this deck simply recurs threats and either wins with the lone Twisted Abomination or Faerie beat down (and yes, I enjoy writing that). Recoil is also simply insane. It hits all permanents, and can remove Guardian of the Guildpact for a turn or get rid of that pesky Armadillo Cloak. 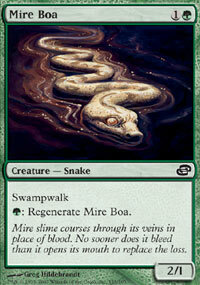 It also hits bounce lands, which is a huge tempo swing in the current environment. This common is a very useful trump. Attrition is currently a better choice than Skies because of resiliency. In the current metagame, decks need to be able to last and win top deck wars. Skies, without Red, tend to dominate turns one through four, but can drop off. Attrition decks can stumble through those same turns, but can then establish a controlling position and slowly bleed life points from your opponents. So I leave you with this question: at what point in the game do you want to be the beat down? P.S. This week for music, I'm going to leave you with two songs I've been listeing recently. One is a song by Canadian psychobillies The Creepshow. The song is Cherry Hill, and for all the cheesy lyrics, it is one heck of a good time. The other is an acoustic punk-folk rendition of Boatless Booze Cruise done by Sundowner- a solo act consisting of the singer/gutarist of the Lawrence Arms. Both are great times, and I recommend listening to both these artists. I think Pure Beatdown in the vein of Cloak Stompy or Frosted Cheerios (the WW Fortify deck) actually are marvelous agains thte blink builds simply because they are so fast. Applying constant pressure to this INCREDIBLY SLOW decks forces them to play from the back foot, which is something they never want to do. 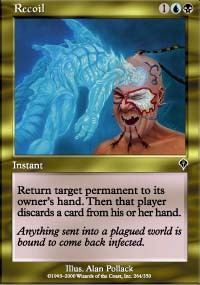 In the next two weeks, I predict a large number of fast and resilinat decks such as those mentioned above, and the old machine head of Affinty rearing it's shiny head. Another good article from the man in charge of PDC games here on PureMTGO. The only comment I will have is that you showed PDC as a format of creature fights only or so I understood. But I don't agree with that. Recently I build a RedBlue control deck which is performing very well. The deck is all about burn, counter, bounce, card drawing, getting those cards back via Izzet Chronarch and then mass burn via Martyr of Ashes and finally win with Wee Dragonauts or Kaerverk's Torch(es). I should also mention that famous mono blue counter deck which is popular and also very powerful. Overall another good article. I might try that BlueGreen deck of yours. Nicely done. Good to hear your comments on the rules of the day. Based on the meta I see, we are turning into a meta of "best attrition deck" vs. "best anti-attrition deck". The best attrition deck is something like Parlor Tricks, Orzhov Blink, or some hybrid, while the anti-attrition decks are the ones that can win while disrupting those expensive recursive cards and being themselves resilient to discard. I don't see a lot of room for pure beatdown decks with zero disruption, as long as there are Aven Riftwatchers winging around. I think that fundamentally, PDC is about creature combat. 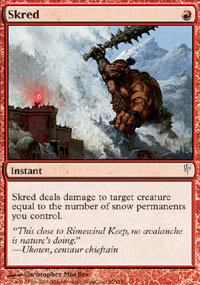 While there are powerful control decks and potent combo decks, most games are decided in the Red Zone. Even control decks have to play a more aggressive game due to the lack of board sweepers, IMO. They play alot more like Angelfire decks, without Wrath and such- beat down slightly, control the game, and burn you out (in the case of the UR deck). There are infinit combos in PDC classic. As a matter of fact I believe I got one from MTGOtraders in the past. Karaganda Pit-Skulk? What was I thinking, that card is terrible!